CraftyRie: Some things about now..
As I was finishing the last of wrap I needed another 'car craft' project so I grabbed another project and popped it in the car....but would you believe the end of the knitting needle snapped off! Arghh! First my knitting needles broke then the end of another pair snaps off! Huh, is life trying to tell me something! 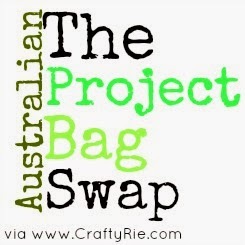 I am also getting people sign-uping for The Project Bag Swap which is pretty cool! If you are in Australia, are you joining in? So.... what things about now have you been up too? Isn't it just fab! I see my mother-inlaw's Christmas presents all planned out from that shop!